Maison&Objet 2015: light from this table lamp by Cuban designer René Barba is diffused by a lollipop-shaped envelope made from a non-woven fabric. Designed for French furniture brand Ligne Roset, the Paper Lamp's double-sided cover lifts over an LED bulb and a black lacquered steel base. René Barba used a tear-proof material made from a polyester and polyamide blend, which was treated to ensure it is non-flammable. 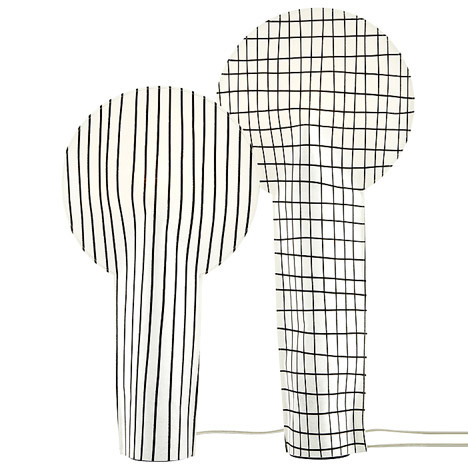 The shade comes in two sizes, both decorated with black patterns that appear to be hand-drawn on one side of the white material. The larger version is printed on one side with a squared motif, while the smaller design features dark vertical lines. "This shade is as light as a feather and gives off a muted light to create a calming atmosphere," said a statement from Ligne Roset's Réaumur showroom, where the light made its debut last month. "With its attractive curves, the delicate nature of its irregular hand-drawn style is the source of its charm." "This kind of graphic effect, currently very fashionable, echoes the strong trend for textured, geometric motifs on flat surfaces in both architecture and interior decoration," added Barba. The lamp is currently on show at the Ligne Roset Réaumur Showroom in Paris, where it was presented to coincide with the city's Maison&Object trade fair last month. Ligne Roset has also recently launched a lamp that looks like a flashlight suspended from the ceiling and a light with a bell-shaped shade similar to a wild flower.